Pony Locale, with Sarah joy Stoker as instructor, is the first and only Body Harmonics Affiliated Teacher Training Centre east of Quebec! With an emphasis on neuromuscular science, established movement protocols, and advanced teaching methodologies, BODY HARMONICS’ internationally acclaimed certification programs, specialist certificate programs, and continuing education workshops are designed to make you the best teacher you can be. When you teach well, you transform lives! Please use the search fields to find this workshop in the yearly list and register. Pilates Level 1: Pilates Mat lays the ground work for the entire Pilates Comprehensive Track. It is divided into four modules. You learn the historical roots of Pilates, key movement principles, 75 mat exercises that build from the Body Harmonics Foundation exercises to advanced Pilates classical repertoire. The program also covers step-by-step cueing and a foolproof approach to building exercise sequences that makes Pilates accessible and challenging at the same time. You leave with a solid theoretical framework and the tools to begin teaching healthy populations in a variety of settings. 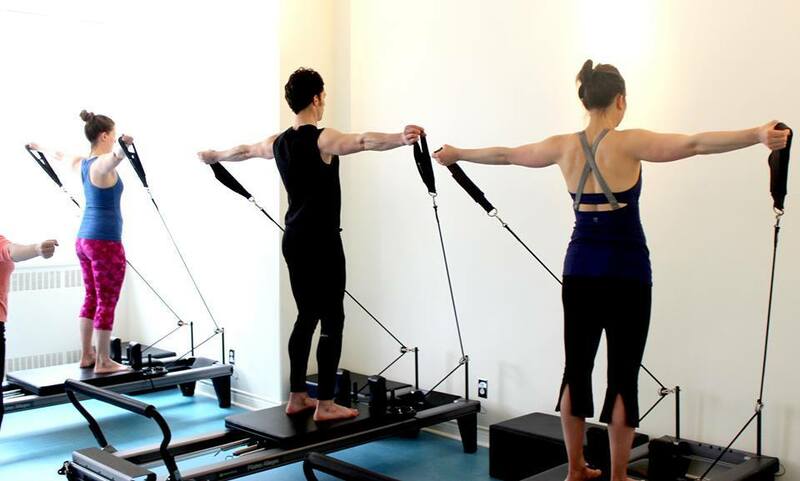 Pilates Level 2: Reformer builds on the concepts of Pilates Level 1: Mat. It consists of four modules. Postural and functional assessments serve as the backdrop to more than 150 exercises and modifications. The focus is the Pilates reformer. The program progresses through beginner, intermediate and advanced repertoire in Modules 1-3, while Module 4 is devoted to practice and personalized feedback. You leave knowing how to build bodies with balanced strength and flexibility, improve movement and function, manage injuries, and fine-tune athletic performance. You also develop skills to teach functional and challenging reformer group classes and conduct meaningful one-on-one sessions. When completing your practice teaching hours at Pony Locale in St. John's, NL you will be given access to the reformers and your clients will pay a nominal fee of $20 by cash (tax included) per hour session. If you complete your practice teaching hours elsewhere where you have access to the machine, you will still be responsible to track your teaching hours including sign off by your clients. External session fees are at your own discretion. Self-practice hours can be completed by practicing on the machine on your own or with your peers. Complementary group classes are included as part of your self-practice hours if you are completing your program in Toronto. These classes may be booked on a drop-in basis at our Dupont and Eglinton Studios. If the class you're interested in is full and there is a machine available in the private room, you may practice on your own in there instead. If the program takes place at an affiliate location, class fees are at the discretion of the facility management. You must accumulate 15 Continuing Education Credits (CECs) every two years to maintain your Body Harmonics Pilates teacher designation. CECs can be earned in many ways: first, by attending workshops at Body Harmonics or one of our affiliated Teacher Training Centres; second, you can attend group classes or private sessions at any of our locations and submit up to 6 hours of these for CEC credit; third, we consider external events relevant to your scope of practice as well. CEC tracking and renewal at Body Harmonics are easy and streamlined. We track everything for you. Any time you have a question, our Teacher Training Advisor can be reached at teacheradvisor@bodyharmonics.com. Our CECs renewal period is every two years and CECs are valid for a maximum of two years from the date they are earned. The program content progresses from one module to the next. As a result, modules must be completed in sequential order to make your learning experience complete and meaningful. To fully benefit from the program, it is in your best interest to commit to the entire time frame. If you happen to miss an hour or more, our Teacher Training Coordinator will assist you with scheduling a private tutorial to make up the missed hours. This private tutorial is an extra cost, and should be completed prior to re-joining the program. Email teachertraining@bodyharmonics.com for more details. Space is limited to 5 people per course so secure your spot! The program tuition and material fees are tax deductible. Taught by Sarah Joy Stoker, Pilates Level 1 is a four-module program that focuses on Pilates Mat Work. It lays the ground work for the entire Pilates Comprehensive Track. You learn the historical roots of Pilates, key movement principles, 75 exercises that build from the Body Harmonics Foundations to advanced Pilates Classical Repertoire. The program also covers step-by-step cueing and a foolproof approach to building exercise sequences that make Pilates accessible and challenging at the same time. You leave with a solid theoretical framework and the tools to begin teaching healthy populations in a variety of settings. St. John's, Pony Locale dates! Register here! Space is limited to 14 people per course and these are advertised all throughout the Atlantic region and country so secure your spot! This workshop literally changes the way you think about, observe, and feel human movement. Fun and interactive, the human structure comes alive. You gain new insights into how the body moves from different perspectives. The ultimate goal of this workshop is to help you understand how movement is produced at all major joints. This understanding lays the groundwork for accurate neuromuscular recruitment, joint mobility and core control. Space is limited to 14 people per course and these are advertised all throughout the Atlantic region and country so secure your spot asap! Margot McKinnon, M.Ed. , founder of BODY HARMONICS, above left and Sarah Joy Stoker, co-founder of Pony Locale. November 6 - 15, 2015 we had the fortune of having Margot McKinnon, founder and owner of Body Harmonics (Toronto) one of the leading Pilates Teacher Training facilities internationally here at Pony Locale launching our new satellite partnership and teaching while she was here! We had such an incredible ten days with her. Congrats to those who completed the BODY HARMONICS® Pilates Mat Work Express™ - an 8 day intensive certification program, and to everyone that took advantage of Margot and the incredible Continuing Education workshops she offered all throughout her stay. Go to http://bodyharmonics.com/training to learn more about their programs, teaching and certifications and http://www.bodyharmonics.com/training/courselisting for a list of all their Continuing Education workshops. These offer dynamic tools to enhance your professional knowledge and skills! Perfect for all movement and manual therapy and training professionals, including Pilates and yoga instructors, massage therapists, physiotherapists, chiropractors, kinesiologists etc. "BODY HARMONICS has been helping people move well, teach well and be well since 1998. Through our Pilates & Movement Studios, integrated Health Clinics and internationally recognized Education Programs, we have inspired thousands of people to transform their lives and careers with our unique whole-person approach to optimal movement, health and wellbeing. Visit www.bodyharmonics.com to learn more." Margot McKinnon, M.Ed., founded BODY HARMONICS in 1998. She and her faculty have trained over 2500 Pilates teachers worldwide and find they cannot keep up with the demand for their approach to Pilates and movement education. "What we do best is take complex concepts, make them simple, and then provide concrete "how to's" to professionals so they can help their clients in an immediate way", says McKinnon. Margot presents at conferences and trainings throughout the year and is affectionately referred to as "the teachers' teacher".